This delicious thing appears on the Foodiful.com site as well. We created this for the Portable Lunches ebook that is exclusive to Insider Club members. But here we are sharing it with all of you! It is the perfect time of year for comfort food, but the added bonus on this one is it is low carb, gluten free and you wouldn’t know it! YAY zoodles. Of course if you wanted to you could add any noodles of choice. Buckwheat (soba) noodles would be awesome! 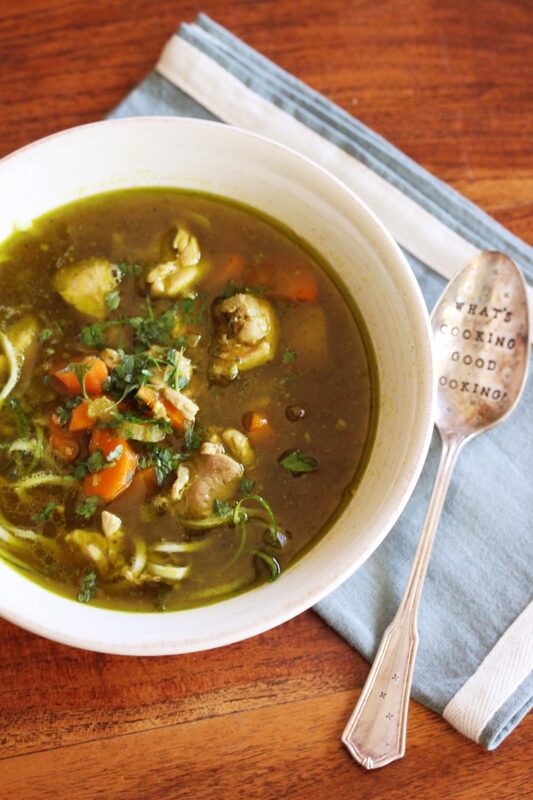 Chicken noodle soup for soul, whichever way you make it! Enjoy...well, we know you will. Place parsley into Thermomix bowl and chop 3 sec/speed 7. Set aside. Place spring onion, garlic, ginger and EVOO into Thermomix bowl and chop 3 sec/speed 7. Scrape down sides of bowl and chop again if any large pieces remain. Scrape down sides of bowl and add turmeric. Saute 5 min/Varoma/speed 1. Add carrot, celery, stock and water and cook 15 min/100°C/Reverse/speed 1. Add chicken and cook 7 min/100°C/Reverse/speed 1. Pour hot soup over zoodles, sprinkle with parsley and serve!